← It’s here…. MY MAJOR HAUL! I’m sure we all have a favorite brush, I know I do. For some reason I can’t seem to find another exactly like it, I’ve had it forever. I love using it everyday with multiple different colors. Before, I would wipe the brush on a clean towel to switch colors. I noticed it never really got all of the color off the bristles. Now, I use the Vera Mona Color Switch Solo and let’s just say I don’t know how I lived before owning this. Pictured is the Color Switch Solo, which is the one I own. There are other options on the website, but for me and my uses this was the best. There’s a Color Switch Duo with a little damp sponge in the middle for applying foiled shadows and whatnot but I’m not into foiled shadows at the moment. 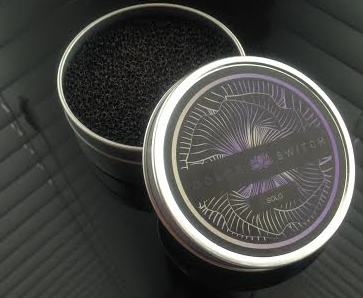 What the Color Switch is though, is basically a stippling sponge, in a tin can. So I’m sure that’s the cheaper option, but as far as I know this company is fairly new and I’m always down to support new companies. All you do is get a brush dirty, when you’re ready to switch colors, swirl the brush against the Color Switch Solo for a few seconds and the brush is clean! This is definitely a must have for me, especially because it’s so quick and easy, AND you can wash the sponge and reuse it. There’s also the option to purchase more refill sponges. I definitely recommend this to anyone and everyone. Whether you just like doing makeup at home, or if you’re a traveling makeup artist. Make this an essential in your kit. This entry was posted in Uncategorized and tagged amazing product, beauty, beauty blog, cheaper option, color switch love, color switch review, color switch solo review, cosmetic, cosmetics, essentials, eyeshadow, eyeshadows, make up artist, make up artists, makeup, makeup blog, modern lady must have, product, reuse, small company, sponge, switch color, The Modern Lady's Guide, TheModernLady, vera mona, vera mona color switch solo. Bookmark the permalink.